Biography of Romantic History Painter, Symbolist. 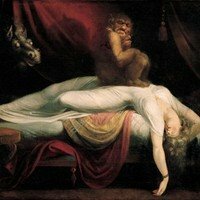 One of the best English painters, and a leading member of the 18th century English Romantic art movement, the Swiss symbolist painter John Henry Fuseli (Fussli) created pictures that explored the darker side of the human psyche. Focusing on history painting as well as allegorical works, Fuseli drew much of his inspiration from literary sources, notably Shakespeare, Milton and Dante. Despite being an important contributor to English figurative painting - he was a contemporary of Henry Raeburn (1856-1823) and Thomas Lawrence (1769-1830) - Fuseli was largely neglected after his death until his rediscovery in the early 20th century by Expressionist painters and Surrealist artists, who admired his romantic subjectivism, complex symbolism and bold composition. At its best Fuseli's work has all the imaginative intensity of works by his friend William Blake (1757-1827), though it is occasionally deficient in technique. His masterpiece is the mysterious work known as The Nightmare (1781). This and several other of his paintings are available online as prints, in the form of poster art. John Henry Fuseli (Johann Heinrich Fussli) was born into a family of distinguished Zurich intellectuals and artists. His father was the portrait painter Johan Caspar Fussli (1706-82). In 1761 he was ordained a Zwinglian minister after studying with the influential literary critics J.J. Breitinger and J.J. Bodmer. It was Bodmer who introduced him to the writings of Milton and Shakespeare and who supported his early interest in painting. In 1764 he went to London where he worked in illustration and published an English translation of "Reflections on the Painting and Sculpture of the Greeks" (1755) (Gedanken uber die Nachahmung der griechischen Werke in Malerei und Bildhauerkunst), by Johann Joachim Winckelmann (1717-68). Determined to become a history painter, he was encouraged by Joshua Reynolds to study in Italy, and to this end he departed for Rome in 1769. His years in Rome, from 1770 to 1778, influenced him profoundly. He soon found himself at the center of a talented group of like-minded English and continental artists which included Alexander Runciman, Johan Tobias Sergei, and Nicolai Abildgaard. In addition to the Antique, Fuseli studied carefully the works of Michelangelo and certain artists of the Mannerism style, and from these diverse sources forged a distinctively personal set of aesthetics. In 1779 Fuseli returned to London and began exhibiting history paintings regularly at the Royal Academy. His picture The Nightmare (1781; Detroit Institute of Arts) was an immediate success. It has become Fuseli's most famous painting, and was a landmark in the development of Romanticism. The Nightmare owes its enduring popularity to 2 main factors: it was one of the first paintings to successfully portray an intangible idea, rather than an event, a person, or a story. Second, the exact intentions of the artist remain obscure. The creature squatting on the woman is an incubus or mara. It is this demon who is causing the nightmare rather than the horse (or "night-mare") that peers through the curtains. Alternatively the painting may have been conceived as an act of romantic revenge. On the back of the canvas, there is an unfinished portrait of a girl who may have been the object of the artist's unrequited attention. In 1786 Fuseli was commissioned to paint nine illustrations for Boydell's Shakespeare Gallery (opened 1789). In 1800 he exhibited 47 paintings of subjects from Milton which had occupied him during the 1790s. He became a member of the Royal Academy in 1799, Professor of Painting in 1800, and Keeper in 1804. His important contributions to the literature and theory of art included his series of lectures to the students of the Royal Academy and his additions to Pilkington's Lives of the Artists (1805), as well as his book Lectures on Painting (1801) and his translation of Winckelmann's Reflections on the Painting and Sculpture of the Greeks (1765). The characteristics of Fuseli's mature style were well defined before his departure from Italy. They included dramatic foreshortening of figures, strong chiaroscuro, extravagant gestures and distortions of scale, and a preference for new, often obscure, literary subjects which stressed the demonic side of human nature. In his works, the aesthetic of the Sublime was given its most extreme visual articulation. He also had a special line in pictures of female cruelty and bondaged males. In addition, he was obsessed with women's hair. Works by Henry Fuseli hang in several of the world's best art museums, including the Louvre (Lady Macbeth Sleepwalking, 1784), the Kunsthaus Zurich and the Tate Collection (Titania Awakes, Surrounded by Attendant Fairies, 1794),the Detroit Institute of Arts (The Nightmare, 1781), and the National Gallery of Art, Washington DC (Oedipus Cursing His Son Polynices, 1786).  For more biographies of Symbolist artists, see: Famous Painters.  For more information about Symbolism, see: Homepage.